The end of the year is almost in sight, time for holidays, time for sunshine and time for fun. I hope all you folks up there in the busy Johannesburg are going to head down to the Coast for some seaside adventure and chill time or escape into the mountains for some rejuvenating, energising time out. GARDEN ROUTE ADVENTURES: If you’re down on the Cape coast this vacation and are looking for some adventures, guided mountain hikes, forest and nature trails or canoeing trips, get in touch with us. A day spent on the glorious Knysna Lagoon on a guided canoe trail is soothing for the soul and as a treat, our famous ‘Summit sandwiches’ are included. The Whale Trail is an Internationally acclaimed 5 night Slackpacking trail traversing the magnificent De Hoop Nature reserve on South Africa’s Cape Coast. You can enjoy walking though coastal plains full of game, meandering along magnificent porcelain white beaches, swimming in the turquoise ocean and whale watching from the shores. Accommodation is in well appointed Hikers cottages, all with great views. What’s ‘slackpacking’? – It’s hiking for smart people; you walk, we work. We make sure your bags get transported to your night’s accommodation, supply the food and wine and we cook your meals. Sounds good hey? This trail is really popular, really, not a marketing gimmick, it’s always full. We have places available on the 29th of September 2013 & the 20th of November 2013, if you are keen to know more, want to book or have other dates in mind, visit our website or email us for details. Keen on a shorter Trail? Join us for the Knysna Slack Packing Trail, a day of canoeing, a day of magnificent beaches and then some forest walking to round off you trip, all meals, accommodation and luggage transport provided for you! Our day adventures of Abseiling, Rock Climbing, Canoeing, Guided Hiking and Kloofing are available to thrill, chill or challenge you 7 days a week and they’re great if you only have a day or two to spare. Our Knysna Adventure Trail is breathtaking. The fresh breeze heralds the start of a sizzling day as you your paddles dip into the glassy Lagoon. The aquatic birdlife keep you company while you spy on the fish as you paddle across the estuary, look up every now and then ‘cause the views from the canoes are spectacular. After a half day of canoeing we enjoy a lunch before heading off to the ocean for a lazy beach walk. It’s a really chilled out adventure, just the perfect way to enjoy those warm summer days. Looking for a little last minute corporate ‘timeout’? Put the team through our Canoe Challenge on the Knysna Lagoon – hey, if you’re from out of town, let us know, we’ll arrange the whole thing for you, flights, transfers accommodation and of course ADVENTURE! Browse through the adventure diary below and let us know if you’re keen to join us – or tell us what dates you have available. We’re also pretty excited about our great new Western Cape Treks. We’ve got some new options coming out for the Swartberg and Cedarberg mountains, by next month the website will be updated with the full info, I must tell you, the Drakensberg does have competition, the Cape’s Cedarberg is rather fine! In the meantime check out our Swartberg Traverse, a great for fit lovers of really wild places. DRAKENSBERG ADVENTURES: Spring came though and delivered carpets of flowers all over the mountains, they’re still there, so book a gorgeous Drakensberg experience to end off your year try our Amphitheatre Trek or combine trekking camping and Rock Climbing in our Double Summit adventure! If you’re not sure what to do with your energetic, adventurous children let them join us in the Drakensberg for 5 days of hiking, Rock climbing and abseiling in the first week of the school holidays. We’ve got plenty of trips to join and if you have specific dates in mind, just let us know. 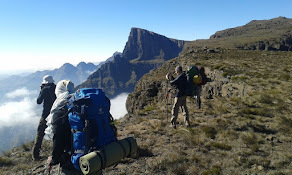 Don’t forget about the ultimate South African trekking experience The Drakensberg Grand Traverse – but only if you keen for a challenge. Our comprehensive, action packed, informative Rock Climbing course is available in December. We teach you everything you need to know from how to tie your first knot and choose cool climbing gear through to the technical nitty gritty of Sport Climbing. Of course this all takes place on real rock, so be prepared to spend a full day outdoors, getting to grips with the rock, uncovering your natural ability to climb and enjoying the awesome sport of ROCK CLIMBING! An action packed 5 days of mountaineering skills and adventures, including Rock Climbing, Abseiling, Hiking and Camp Craft for 12 to 17 year olds.